July 12, 2015 (Tony Cartalucci - NEO) - Late last year, Germany’s broadcaster Deutsche Welle (DW) investigated what turned out to be hundreds of trucks a day carrying billions of dollars in supplies, flowing across the Turkish border into Syria and directly into the hands of the so-called “Islamic State” (ISIS). Image: The summation of ISIS' supplies come from NATO and US-allied territory, primarily Turkey and Jordan. Turkey in addition to being a NATO member since the 1950's also hosts a US air base. No efforts have been made, nor any calls even, to secure Turkey's border and deny what is alleged to be an implacable enemy of the West billions in supplies passing through the West's own territory and into the theater of conflict ISIS is operating in. Reports of confirmed, extensive logistical networks passing through NATO and US-ally territory, into Syria, contradict the current prevailing narrative that ISIS is an "indigenous" terrorist organization, funded and self-sustaining within the territory it currently holds in both Syria and Iraq. The Western media has attempted to claim with little evidence that ISIS' immense, global operations are somehow underwritten by "ransom payments" and "black market oil" it has seized in eastern Syria. Clearly, not only are these reports as untenable as they are untrue, the Western media itself has reported precisely how ISIS has been sustaining its impressive fighting capacity - with billions of dollars of state-sponsored aid flowing through NATO territory, directly to their front lines. Were the supplies flowing over the Syrian-Iraqi border, it may be possible to argue plausible deniability - with the governments of either nation unable to control either side of the border. However, Turkey, a NATO member since 1952 and host of the United States Air Force's Incirlik Air Base, has full control of its borders meaning that ISIS-bound convoys not only pass over its borders with the apparent approval of Turkish border guards, but are assembled somewhere within Turkey itself before arriving at the edge of Syrian territory. The Brookings Institute from which these plans originated, recently used an ISIS assault on Kobani to call for "US boots on the ground" in Syria, an assault which would have been logistically impossible were it not for the daily torrent of supplies the US and its NATO-ally Turkey have themselves intentionally enabled for years to cross into Syria. 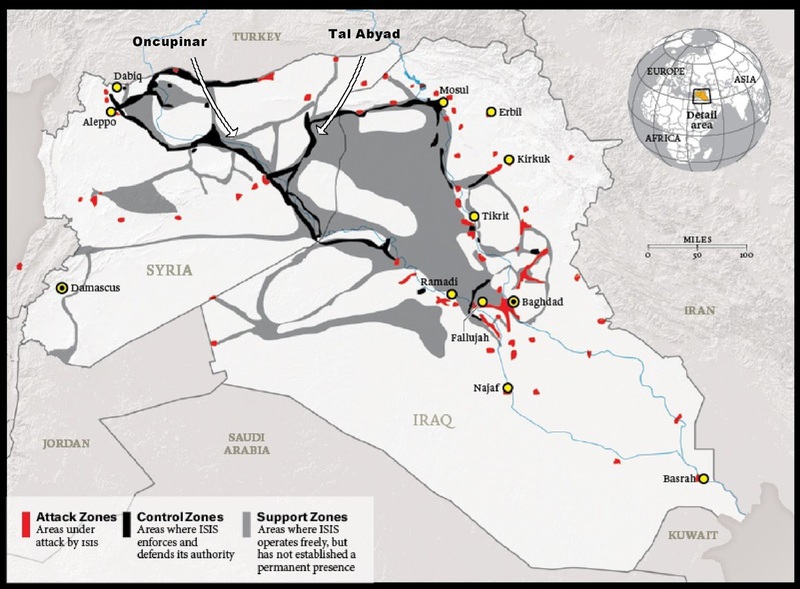 To defeat ISIS, its supply lines must be cut - a simple matter to perform that requires only Turkish and other NATO troops to move in and disrupt overt ISIS logistical networks running within their own territory. Instead, the US State Department and US-operated NGOs have even gone as far as condemning what little attempts have been made to control Turkey's border with Syria. The US State Department's Voice of America in their article, "Turkish Border Crackdown Imperils Syrian Refugees," used the pretext of "human rights" to condemn Turkey for what meager control measures it has attempted to put in place. The fact that the US, with a military base in Turkey itself, has elected not to call for or attempt to implement stricter border security to stem the flow of ISIS supplies, and instead has gone as far as bombing Syrian territory in feigned efforts to "fight ISIS," proves that the terrorist organization is both a proxy and a pretext. No serious military campaign would be launched against an enemy without identifying and cutting off its supply lines, especially when those supply lines run through that military's own territory. The general public across the West, if they truly desire an end to ISIS and its atrocities, will demand what least the West can do - shutting the borders of Turkey and Jordan and ending the flow of supplies to ISIS. This will never happen, thanks to both elementary but effective "divide and conquer" rhetoric miring the Western public in endless circular debate, and the fact that the average Westerner's understanding of modern warfare and military logistics is derived from Hollywood and television, not maps, history, and basic knowledge.